Everyone knows how important it is to maintain your credit scores. This, of course, is accomplished by making on time payments, steering clear of over the limit fees and avoiding the temptation of having an over-abundance of credit cards. But what happens when you’re new to the credit game? This can happen with younger adults who might be preparing to begin their careers or a couple who faced difficult financial times and filed bankruptcy. Those who have always resisted the temptation of having any credit history at all or even elderly people who haven’t had to access their credit options in recent years can also find themselves with limited options. There are very few of us who will go through the course of our adult lives without the need for credit. If you’re new to the credit game, for whatever reason, here are a few things that might help get as move forward to establish a credit history. What few people know is that FICO has an alternative method of figuring a credit history for those with no established traditional lines of credit. Your lender may be able to garner an approval by using this option. It considers other payment histories that aren’t typically reported to FICO, such as your checking account history and whether you’ve had overdraft charges or perhaps even your rent or lease if you don’t own your home. This might not be something a lender is willing to do, but then again, it just might be what you need to ensure an approval for a credit card or bank loan. This is sometimes known as VantageScore, so you’ll want to ask about that too in case your lender doesn’t consider the FICO expansion model. The secured credit card model is built on allowing those with new credit lives to expand or begin their credit histories. 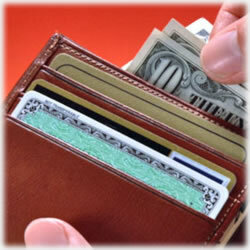 Keep in mind there’s a difference between prepaid credit cards and secured credit cards. With a secured credit card, you’re “securing” the credit line with a matching deposit. You pay the credit card each month the same way you would any other expense. The HSBC MasterCard offers all the benefits you’d expect from a credit card. There’s a cash back rewards program, a 0% introductory APR on your purchases for the first nine months and you’ll enjoy 24 hour, 7 day a week account access. You can easily set up text or email alerts and pay your bills online and at no additional cost. Your APR will be based on your credit history, which means it might be higher than average; however, it will fluctuate as your credit scores either improve or you’re able to build a more complete credit file. There is an annual fee, but it too is based on your credit scores. The Applied Bank Visa is an ideal solution for many consumers. There are no set fees and no annual fee associated with this offer. Your APR is fixed at 9.99% and you determine your credit limit based on your matching deposit, though there is a $200 minimum. It too reports to all three credit bureaus, which allows you to build a stronger history. It has all the benefits that come with the Visa name, including fraud protection and other perks. While it’s not a quick process, setting the wheels in motion to establish or rebuild your credit history takes only a bit of time, focus and commitment to staying on top of your finances. The objective, of course, is to ensure the freedom that comes with strong credit scores. It’s that freedom that keeps your options open.